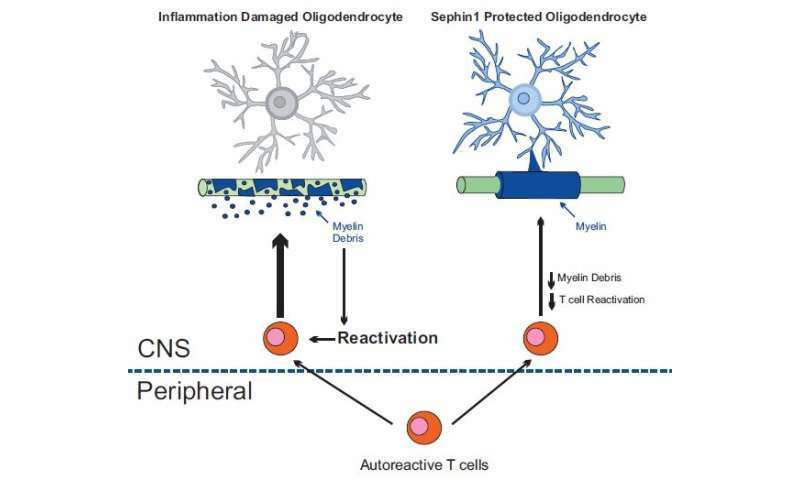 Sephin1 delayed the onset of clinical symptoms, reduced oligodendrocyte and axon loss and diminished T-cell presence in the central nervous system. Credit: Brian Popko, Ph.D., the Jack Miller Professor of Neurological Disorders and Director of the Center for Peripheral Neuropathy at the University of Chicago. In the journal Brain, a team based at the University of Chicago show that treating mice suffering from a mouse model of MS with Sephin1 (selective inhibitor of a holophosphatase) was able to "delay the loss of myelin and postpone the onset of debilitating disease," according to senior study author Brian Popko, Ph.D., the Jack Miller Professor of Neurological Disorders, and Director of the Center for Peripheral Neuropathy at the University of Chicago. 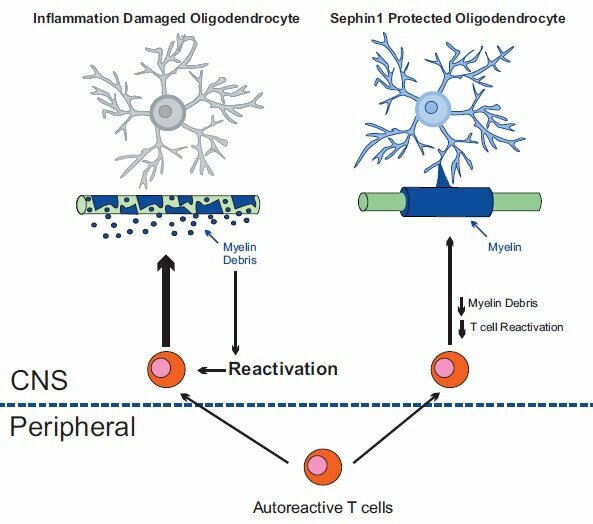 Current MS treatments focus primarily on limiting the immune system's misguided inflammatory assault on oligodendrocytes and the myelin sheath. These anti-inflammatory therapies dampen the autoimmune response to varying degrees, with the most effective treatments carrying considerable risk for opportunistic brain infections, highlighting the need for safer therapeutic approaches. A promising drug called guanabenz (marketed as Wytensin), used to treat hypertension, "appears to enhance the oligodendrocyte's own protective machinery to diminish the loss of myelin," said Popko. But this drug has side effects. It can cause drowsiness, weakness, headache, dry mouth and even coma. In studies that involve giving Sephin1 to mice with experimental autoimmune encephalomyelitis (the mouse version of MS), "we found that it offers therapeutic potential with no measurable adverse effects," said Yanan Chen, Ph.D., a postdoctoral fellow in the Popko laboratory who led this project. "By protecting oligodendrocytes and diminishing demyelination we also reduce the generation of myelin debris," Popko said. "The decreased exposure to myelin fragments should also limit the auto-immune response." This protective focus on oligodendrocytes provides a new therapeutic approach for MS. Since Sephin1 targets a process distinct from the current anti-inflammatory approaches it may prove beneficial when used in combination. "Encouragingly, adding Sephin1 to the established anti-inflammatory MS drug interferon beta provided additive benefits to the mouse MS model," Chen said. More information: "Sephin1, which prolongs the integrated stress response, is a promising therapeutic for multiple sclerosis," Brain (2019).